This country is tearing our families apart. We’re talking about the inhumane immigration policy that was dominating headlines these past few months. While it may seem like old news- another 13,000 children traveling alone- many on their way to be reunited with family- are still in federal custody. 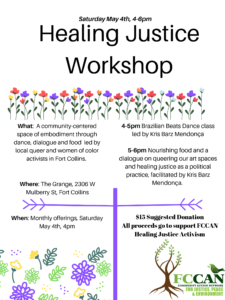 Fuerza Latina, founded by and for immigrants in Fort Collins is doing the work to build a power base for those rendered invisible and vulnerable by our racist immigration policies. But at FCCAN we are also talking about the institutional forces of oppression which continually tear families apart. The law which prioritizes capitalist greed over housing rights, protecting those in power and dismissing housing as a human right. The Fort Collins Homeless Coalition is doing the work to ensure that families are not torn apart when they can no longer share a roof at night. Environmental justice has been a movement historically led by white males who have rallied around the images of sustainability, more inclined to talk about parts per millions than addressing how U.S. driven climate change threatens the land rights and human rights of Native American and low income, communities of color. FCCAN recognizes that we must respect the leadership of Indigenous, Black and people of color as the front line communities who are most impacted by climate change- and do so as a deliberate, strategic choice made as a means to not only end the legacy of injustice in this country but an effort to protect our earth and future generations. Yes, all of these forces of oppression tear families apart, and while they are not in the headlines- FCCAN is doing the work to address these everyday realities with and for our community. For us, knowing that we will be spending the upcoming holidays with our loved ones reiterates the necessity to continue acts of mutual aid for our chosen families here in Fort Collins. Lots of folks in Fort Collins who rely on our work are most affected by the burdens of poverty. We aren’t expecting or asking these important leaders in FCCAN to donate- but we are asking everyone else who can throw a little mutual aid our way because your money not only supports our work but the wide base of coalitions we support. 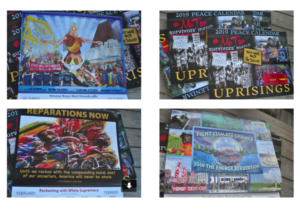 When you sign up to become a monthly sustainer at $25 or more, you will be gifted a beautiful 2019 Peace Calendar, which features social justice organizers and resisters from all over the country and the world. Donte to FCCAN so we can continue to do the daily work of grassroots activism and get your free calendar. 1. Head on over to our donation page. 2. Click the “Donate” button (or send us a check in the mail or call us at 970-419-8944 to donate over the phone! ).